The life of a political dissident can be rather strenuous to a person’s work schedule. No one in the NBA knows this better than Knicks center Enes Kanter, an outspoken critic of Turkish president Recep Tayyip Erdogan and the government he presides over. 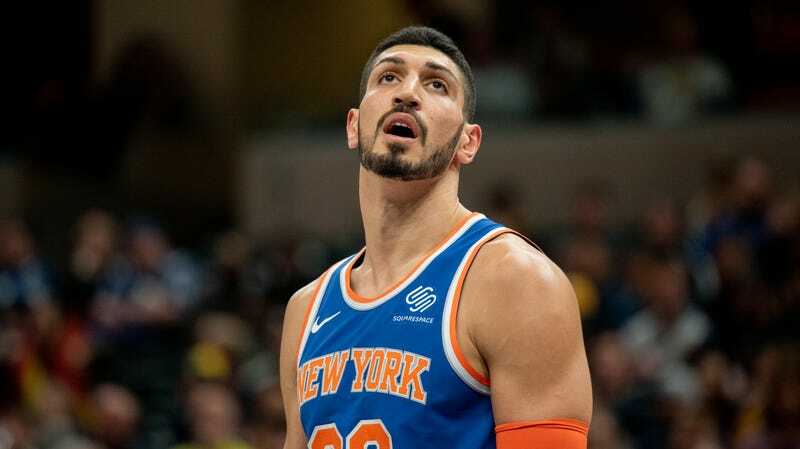 After his team’s win over the Lakers on Friday, Kanter announced that he would not be joining the Knicks on their trip to London for the sake of his own safety. “Sadly, I’m not going because of that freaking lunatic, the Turkish president,” Kanter said after the Knicks’ 119-112 win over the Los Angeles Lakers on Friday. “There’s a chance that I can get killed out there. So that’s why I talked to the [Knicks’] front office. I’m not going. To say Kanter and the Turkish government have been at odds would be a bit of an understatement. In May 2017, he was detained in Romania after his Turkish passport was seized. A month later, the government arrested his father, but released him a week later. Soon after that, Turkey sought a four-year prison sentence after Kanter insulted Erdogan on Twitter last year. Because of these incidents, as well as the consistent flood of death threats and hatred he receives for his political beliefs, Kanter does not really leave the U.S. unless it’s for a game against the Toronto Raptors. As for what he’ll do for his free time, Kanter says he’ll “stay home and practice” instead—hopefully on his defense. Turkey Indicts Enes Kanter&apos;s Father For "Membership In A Terror Group"
Enes Kanter On Turkey Seeking Four-Year Prison Sentence For Him: "That&apos;s It?"